A blue printed version of the pattern is shown here on a 9.75 inch plate with an impressed "Lakin" mark. 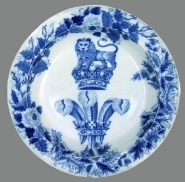 An earthenware plate printed in blue in an armorial pattern consisting of the Prince of Wales feathers, a lion on a coronet and a border printed with the Union flowers: rose, thistle and shamrock. The background is painted in red with a mesh-like pattern and red enameling has been added to the rim.